Just a few ideas that I thought i would share that I used with my squad. We regularly did 10m running start and 20m speed bounds. I count the number of steps and also time the 20m interval. The athletes aims to improve by decreasing their score. The score is the number of steps x the time in seconds eg 7.5 steps and 2.6s is 19.5. The advantage of speed bounds over normal bounding is that ground contacts are quicker and even more so with a running start. This makes them a more specific activity. 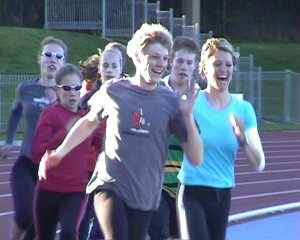 Athletes usually only have 3-5 attempts at the start of a session. This is usually done in the pre-competition phase of the year. Usually performed on grass in flats. Athletes can do 60m of relaxed bounding and maybe build up from 5 x 60m to 2-3 sets of 5 x 60m. The maximum volume may take up most of the athletes capacity within a training session. It would be a session in itself. Athletes can sprint maximally for 30m and reach speeds well in excess of what they will reach at any stage of a race of 400m or more. Sprinting reaching high speeds for a very short duration is much safer than trying to hold good sprinting form at maximum effort over longer distances eg 60m or more. Athletes may only do 3 x 30m sprints at the start of a session. This is always a safe distance to sprint where going further can cause hamstring tears in people who are prone to them. I never ever saw an athlete hurt a hamstring in a 30m sprint. Once learned and shaped to the right model of movement can be then performed very fast for much greater gains in speed. It gives the nervous system a chance to practise quicker movements. A good way to prepare to be able to do very fast training 400s i.e. at speeds that are as fast as the first lap of an 800m. The athletes can start at shorter distances at their target speed and move up in distance as their sustainable speed develops within the season. The ability to sustain higher speeds at distances further than 200m is very training specific and is something that can be acquired quite quickly. The faster the speed the shorter the distanceneeded to develop it. Even 100m sprinters need to work at developing their endurance of near absolute maximum speed. No amount of training at lower speeds over longer distances can have a big enough effect. The activities need to be at the target speeds of the event. ed and the ability finish strongly. This needs to be varied throughout the year and culminate in light power development work. I believe in improving strength and power in the gym and leaving the endurance training for the track and circuit work done in sessions at the track. The only endurance work done at the gym is usually mid torso training. quick contacts with the track. So the hurdles are kept low to allow this to happen. Also this should be done in low volumes only eg 10 sets of 3 contacts with double legged bouncing. Base training usually involves plenty of hills and bounding up hill. This slowly builds up strength endurance. Changing pace needs to be practised to be developed. 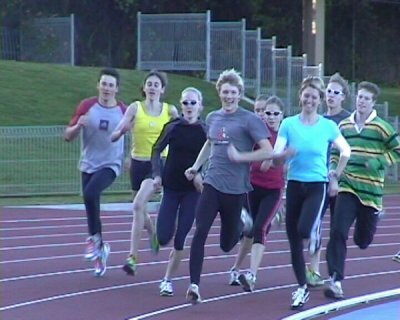 Simulating race pace conditions is great fun for the athletes. Get the athletes to “bounce each other around” and take turns being the first person allowed to change the pace. This is great fun and great preparation for racing.